You’ll get lots of software utilities over the net with which you could safeguard all your private files and folders. My Lockbox, Safehouse Explorer, 1 Second Folder Encrypt and Hide Folders are some of the examples of such utilities. Nevertheless, if still you want an effective alternative for such software applications, then Easy File Locker is a perfect one. With this software utility, you could secure your private files and folders with different security levels. This provides an effective security to your sensitive data and no one could access them in your absence. This utility is found very useful, especially when you’re working in shared PC system. 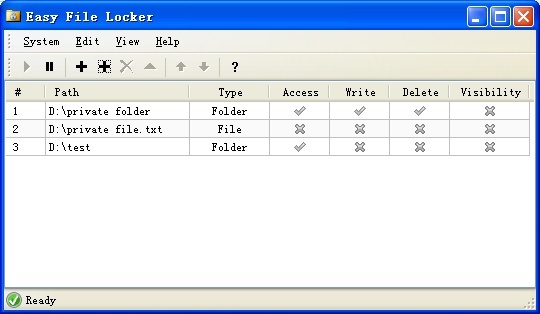 Easy File Locker has very simple GUI, which makes adding and browsing of files and folders much easier. This utility offers different security levels such as ‘Writable’, Accessible’, ‘Visible’ or ‘deletion’, which could be selected with simple GUI, making it more user friendly. With these options, you could restrict particular files or folders for read only mode. This also prevents you from deleting the files unintentionally. It features the invisibility mode by allowing you to hide your data, which will be invisible to others. Moreover, you could set the master password, which locks lists of files and prevents them from being accessed by third party user. All in all, it would be a great experience of using this utility to keep you private data really ‘private’. It works well with all Windows operating systems and you could download it freely using the link given Here.